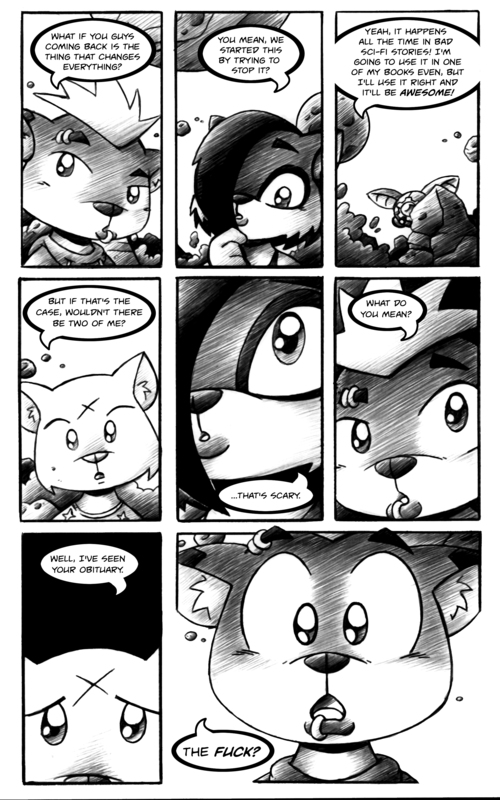 Panel 3 show the clockwork Navi resuming its standard activity when in the wild, observing the back of Linna’s head. It also contains what appears to be some top quality lampshade hanging. My mind is going around in loops trying to parse Corvus’ statement. I imagine the actual explanation is going to catch me unawares. What he says could imply a lot of things, but the bit about the obituary seems to discount a bunch of them. A) Corvus might simply not understand the paradox, but then the bit about the obituary doesn’t follow. B) Corvus might actually be quite old, with future Brother Moon level technologies keeping him young. The obit reference could imply that he read it when it was originally published, and so he should exist in the past as well. This seems unlikely, as this scenario would result in two Corvus’ in the same time period, which he appears to be discounting. C) The obituary that Corvus has read has already been made impossible by the events which has transpired. Classically, the paradox referenced has events transpire in a loop. Person a goes back to stop event B, and in so doing causes event B, leading to Person a goes back…. If this is a classical paradox, the obituary was accurate, and Corvus read it because Tussel was the distortion; then went back and changed things such that the obituary can’t have happened, Tussel can’t then be the distortion because of Corvus’ actions without there being two versions of Corvus. One version would have been sent back from a future different then what Corvus (as we know him) experienced and caused Tussel to be the distortion. That would lead to Corvus'(as we know him) timeline and he would come back in the middle of himself carrying out the actions which cause Tussel to be the distortion. This only holds so long as the paradox is an exact loop. In a metastable loop, the differences can be explained away as slight variations which don’t preclude Corvus from traveling back and propagating the paradox. Of course all of this is so much guesswork, and we don’t actually know that there ISN’T a second (or third, or fourth…) version of Corvus hanging around in Tussel’s home reality. I can say is Tuesday’s page will help explain, but there’s still plenty more story to go beyond that!